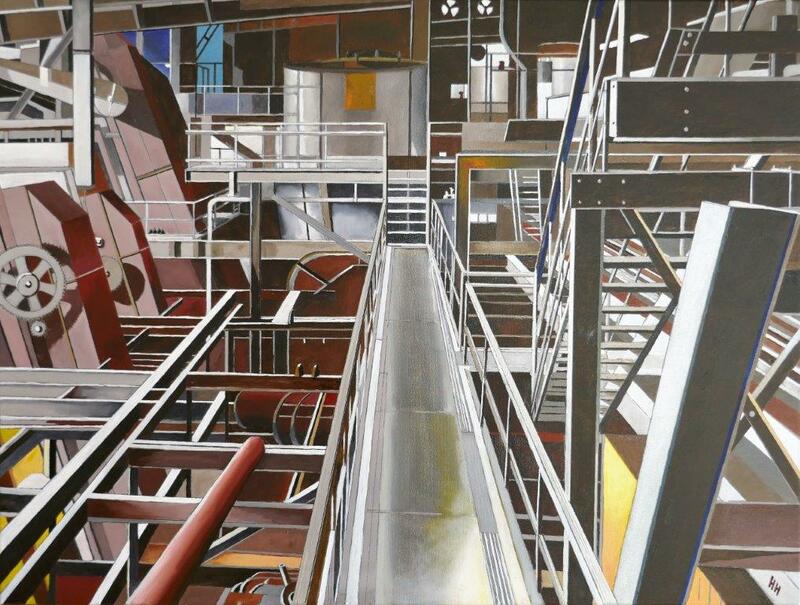 This painting is inspired by a visit of Bert to the World Heritage Site Zollverein, near Essen in Germany. 'The gateway' can be discovered inside the former coal washery. Being 90 metres long, 30 metres wide and 40 metres high, the former coal washery is the largest building of the Zollverein Coal Mine. When in operation it was a large-scale machine serving the sorting, classification, intermediate storage, and distribution of hard coal. Its architectural shape is completely subordinated to this function. Since the conversion by Rem Koolhaas‘ Office for Metropolitan Architecture as well as by the architects Heinrich Böll and Hans Krabel, the building has accommodated the visitor center, the Ruhr Museum, the Portal of Industrial Heritage, and Denkmal. The Zollverein industrial complex in Land Nordrhein-Westfalen in Germany consists of the complete infrastructure of a historical coal-mining site, with some 20th-century buildings of outstanding architectural merit. It constitutes remarkable material evidence of the evolution and decline of an essential industry over the past 150 years.